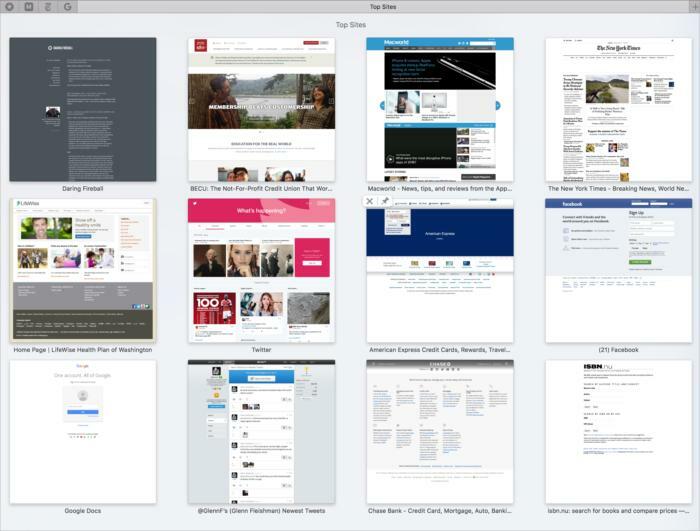 Confused with how Safari's Top Sites feature works? Here's the lowdown. When viewing the “top sites” grid, it can be either a website “picture” of the webpage or the standard icon of the website. How is it done? I can’t find how to change it. This puzzled me, as while I don’t use Top Sites regularly—a page that shows your 6, 12, or 24 most frequently visited sites—I recalled this icon view, too. It turns out both Deva and I are conflating two separate, but similar features in Safari. The Top Sites view in Safari shows thumbnails. But there’s no option to view icons. For that, click in Safari’s Location bar. After a moment, a drop-down display appears populated with icons. At the top, Safari shows the contents of your toolbar favorites; at the bottom, the most frequently visited sites. I noted that it’s not a precise match with Top Sites, but this may have to do with how it sorts results. The icons for most-visited sites appears as part of a drop-down view from the Location menu. So that’s where you find the icon view, but here’s a twist that makes this particularly confusing: clicking in the Location bar while viewing the Top Sites page results in no dropdown area of icons! It feels like you’re being gaslighted—you know the icons should be there, you click, and no icons. On any regular page or a blank page, clicking the Location bar produces the same icon display.